KEEP CALM AND CARRY ON: Grayson: 8 Months Old! 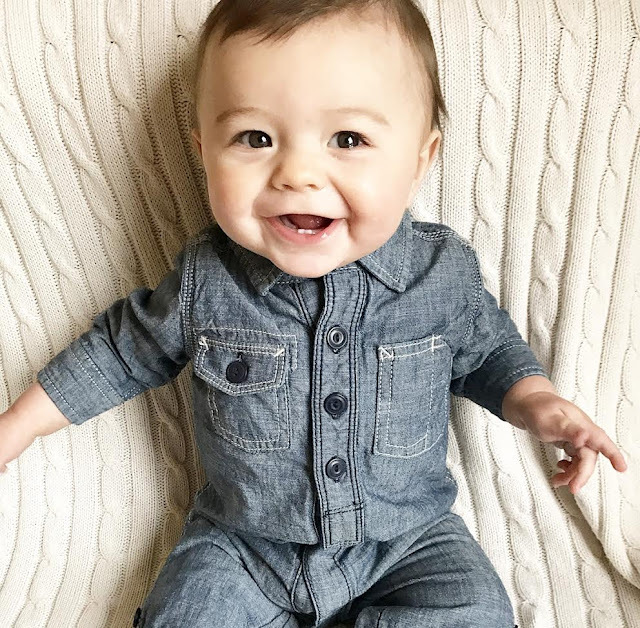 Happy 8 months to our baby boy! 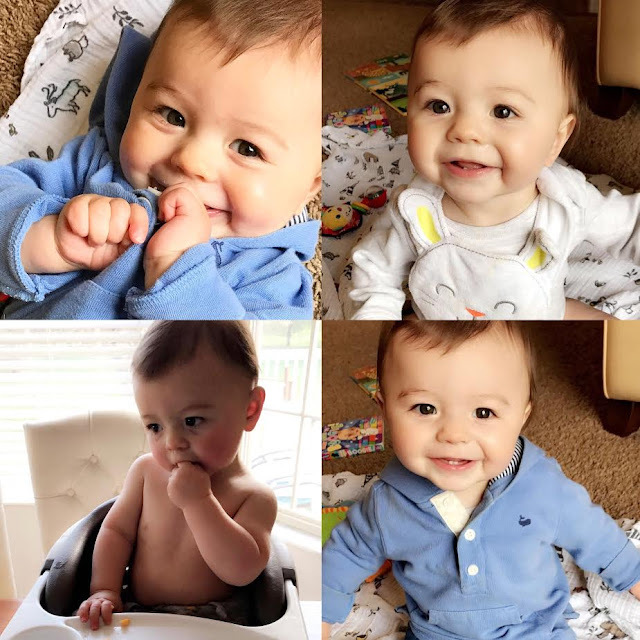 This month Grayson really wanted to show off his growing and fun loving personality. And it is just the sweetest. I always tell people that I think he's going to be really kind because he is so sweet and gentle. He is now babbling mama, dada, and baba (started saying all 3 within a day or two of each other! 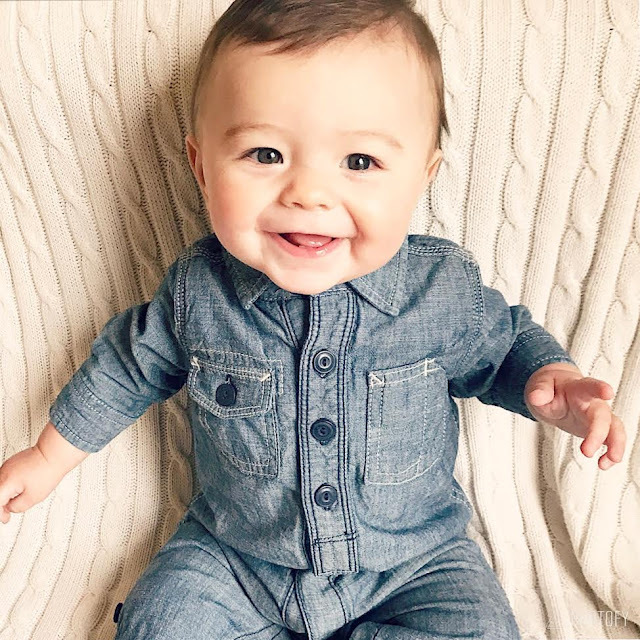 ), laughs all the time, gives the cutest high-fives, has started to enjoy reading books, and gives the very best open-mouth kisses. It's funny because him and Camden are very similar in certain ways, but when it comes to their temperaments they are pretty much opposites. Both very happy babies (I swear they have the same exact laugh), but Grayson is laid back, easy going, and not so busy. He loves to observe and take things in, although I'm sure this may change once he starts crawling. He gets on all fours and has started rocking back and forth, so crawling is JUST around the corner! But I'm totally okay if it's not because like I've said before STAY. THIS. AGE. FOREVER. Please and thanks. 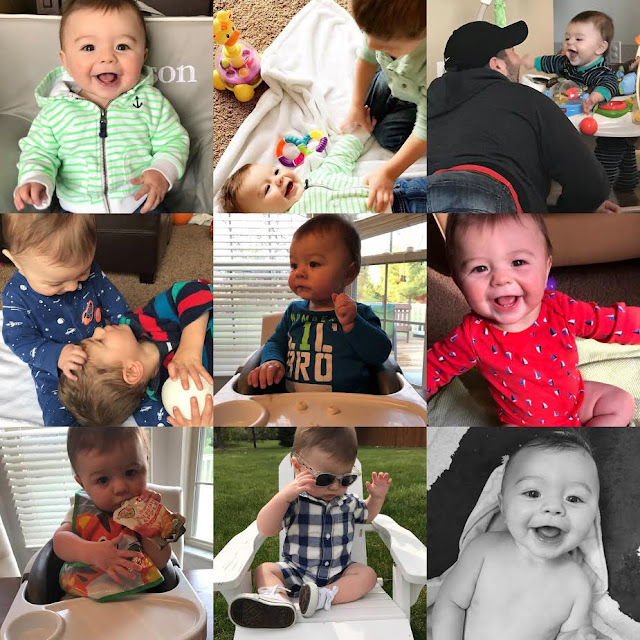 Milestones//Special Moments: Waves // Stands really well (with support) // Eating more solid foods and less purees // Grabs and reaches for everything // Still only has his 2 bottom teeth but he has 2 on top that are this close to coming in // Says mama, dada, and baba! Weight/Height: He didn't have a doctors visit this month, so we will find out at his 9 month but I have a feeling he's gained a lot - he feels so much heavier! Sleeping: Still 3 naps during the day (longest being from about 1145am-2) then eats at 7pm and goes straight to bed! He is still in his sleepsack and really loves sleeping on his side (and sometimes his belly.) We're about to transition him to 2 naps. Dislikes: When his food is all gone! Health: No sicknesses recently, YAY! We are loving watching him grow, but savoring all the moments we have before that big first birthday. Don't even want to think about that...no, no. We love you SO much, Grayson! He is just too adorable, Katie! :) This age really is so much fun... although I seem to have been saying that for the past 5-6 months haha!